Here is the second mini mug from the recent weekend release. Starbucks You Are Here Ornament Switzerland is a colorful representative of this adorable series and has everything this country is famous for: cheese, chocolate, watch, lakes, and mountains. And for the latter, designers specifically depicted the Matterhorn, a pyramidal peak between Italy and Switzerland. The four steep faces, rising above the surrounding glaciers, face the four compass points and are split by the Hörnli, Furggen, Leone/Lion, and Zmutt ridges. 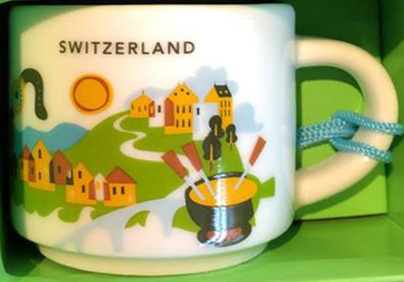 As for the bear (on the back of the mug), this is probably related to Bern, “city of Bears”. According to the legend, the city owes its name to this animal which can be found on flags, water fountains, buildings, and even litter bins.